Did you know? 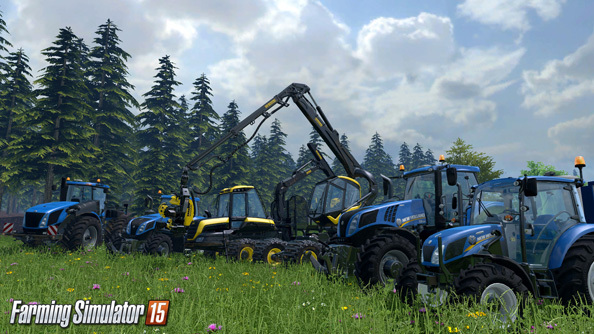 The last iteration of Farming Simulator sold over two million copies. Agricultural emulation has become more profitable than rearing actual, foul-smelling mammals. That’s why Giants Software and publishers Focus Home are, as their press release puts it, “sticking to the recipe”. Farming Simulator 15 won’t change up the pig feed, but it will stick a new graphics and physics engine in its tractor this October. The business is the same as it was: growing crops, selling produce, tending to livestock, and managing an expanding farming complex. Two “immense” open worlds will be the fields we reduce to nostalgic memory – and at least one of them will be a new, ‘Nordic’-styled landscape. With award-winning fjords, no doubt. Just as it’s most respectful to use every part of the animal, it’s apparently also best to level every part of the map. Even the forests aren’t exempt from the rule: new harvesters, chainsaws, chippers and trailers are designed with logging in mind. They’ll join a “long list” of agricultural machinery slavishly copied from real-life models by manufacturers like Case IH, Deutz-Fahr and, er, Lamborghini. But the “totally-revamped” game engine is the new hotness. The next Farming Simulator will be able to handle visual effects and rendering “way ahead” of its last version, and go a long way to making its vehicles look photo-realistic. There’ll be 15-farmer multiplayer and mods, and it’s coming to PC first. Are simulators the chugging heart of Steam these days?